Beautiful sport climbing on amazing clastic flow (or welded tuff, I am not sure, see the below comment!). In my opinion, this is the best sport climbing in New Mexico. Note that the guidebook that exists for this area is certainly worth the purchase, it has great topos and directions to the climbs and areas. 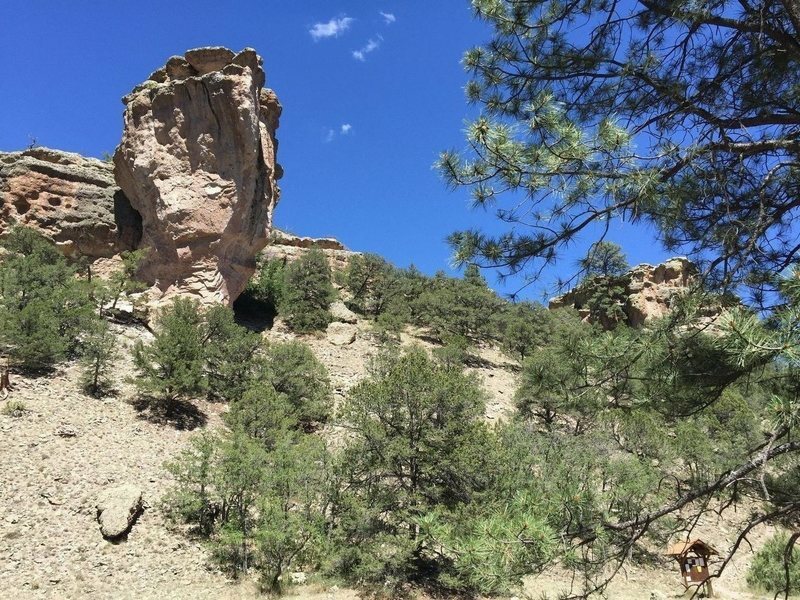 An excellent history of Socorro-area climbing, including the Enchanted Tower, is worth a read. 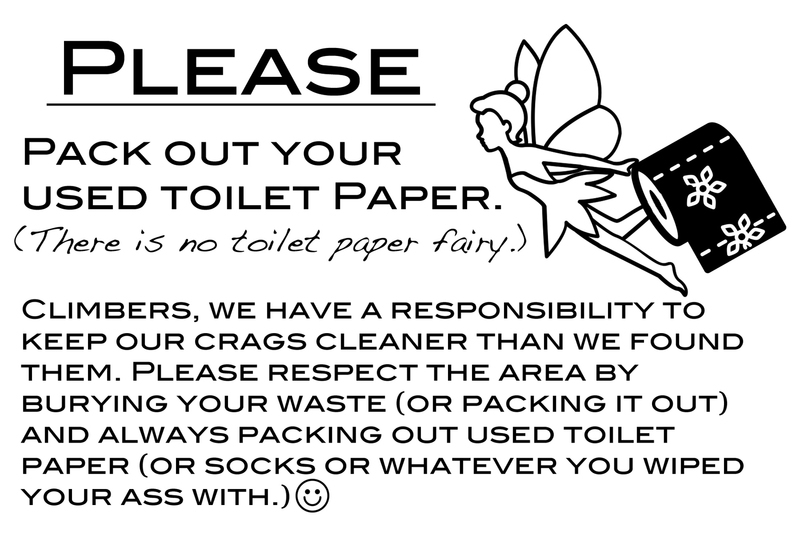 Keeping Enchanted Tower Clean: PACK OUT YOUR POO! This is an important topic that is worthy of discussion with more climbers visiting enchanted tower. The area surrounding enchanted tower is a beautiful one and I'm sure everyone agrees, we would like to keep it that way. An ever increaing amount of human waste is being found surrounding the camping area and even at the base of the crags (disgusting!). The idea of a pit toilet has been discussed. However, for various reasons, it sounds as if this is currently not an option. The use of Wag Bags or RestStop2 bags are an ideal solution! Or, and alternative might be a bucket with a lid and plastic kitchen garbage bags. Put the bags in the bucket like you would a regular garbage bin, do your business in the bag, tie it up and put the lid on. You can even add litter or some other liquid absorbing media. Used Wag Bags or RestStop2 bags can be disposed of with regular trash, such as a dumpster as you pass through Datil on your way back to Albuquerque. Enchanted Tower: Are we our own worst enemy? For many years climbers enjoyed privileged, short and easy access to Thompson Canyon and the Enchanted Tower via a crossing through a private ranch south of the Tower. Unfortunately, continued abuse of this privileged access by both climbers and other land users forced the ranch caretakers to close this access. As of April 2013 the standard access to the Tower is via what used to be known as the "alternative" access. The directions here reflect this new standard. Access to the Enchanted Tower is via a long, rough road through Thompson Canyon/Davenport Lookout. High clearance highly recommended. The following directions are provided by Jason Halladay, May 2013. From the intersection of Highway 60 and Highway 12 in Datil, NM, drive 9 miles west on Highway 60 to a signed turn at the dirt Forest Road 6. Turn right on Forest Road 6 and drive 2.8 miles north on FR6, past the now-defunct Mojave Academy buildings, to Forest Road 59. Use caution on this stretch of road as two new cattle gates have been added as of July 2014. In particular, the first gate, about a quarter mile from highway 60, is a barbed wire and wooden posts gate with no reflectors. It's nearly invisible at night! To this point the road is good dirt road. Turn right on FR 59. The road quickly gets steeper and rougher as it ascends to the Davenport Lookout. Just before the Davenport Lookout, below a large tower, take the road to the right that quickly descends into Thompson Canyon and turns into Thompson Canyon Road. The distance from FR6 to Thompson Canyon Road is 2.9 miles. Continue on the occasionally-rough Thompson Canyon Road, past The Land Beyond, for 4.5 miles to The Enchanted Tower area. From Highway 60 this approach takes 45 to 60 minutes. High clearance is highly recommended. A Subaru Outback or similar will do OK with careful driving. * Arriving after dark despite sign clearly stating no entry after dark. Seriously NEVER drive on the ranch road after dark! Camp at the Datil Well Campground outside of Datil and drive in in the morning. This road is private property for the next 1.5 miles. Please respect the restrictions below. If you do not, permission to use the road will likely be revoked. *At any time after dark. *The owner may temporarily close it at other times. Please respect temporary signs. *You do so at your own risk. It is not maintained and, for example, is unsuitable for passenger cars. *No RVs or other heavy vehicles are permitted. *Do not exceed 15 mph. *Leave gates as you find them (open or closed). *[Remove all waste, including human waste]. East to West, or right to left as you see them from the road. - Rapunzel Wall: Nice beginners wall. This and Mother Goose wall are great for beginning leaders. Bolts can be a bit high and the cruxes are at the start. - The Enchanted Tower: The namesake of the place; beautiful. Routes from 5.11b to 5.13a. - Sleeping Beauty Wall: Nice selection of 10s and 11s. - Pogue's Cave Area: A number of great 10s and 11s. - Mother Goose Wall: Largest selection of beginner routes at the tower. Again, a good wall for the aspiring leader. - Renaissance Wall: Only three routes on this wall, one being the hardest at Datil at 5.13+. - The Land Beyond: Continue driving down the road to this one. About 1.5 miles west, past the main tower area. A few 10s but a great selection of .11 and .12 routes. - Now defunct original online guide snapshot from October 2009 via wayback machine. - Dr. Topo also has an online PDF guidebook. Go into the website (drtopo.com/) and go into the miniguides section, and click on New Mexico. Double rainbow over the Tower - Aug. 31, 2008. Photo of the Tower itself. Anyone been out to the tower recently? I'm curious about the road conditions with respect to all of the snow we've gotten. Hey Devin, I've not heard of anyone climbing here in winter. In a typical winter you'd probably need to snowshoe or ski on the road beyond the ranch house. I'm not sure about this but it certainly wouldn't surprise me. Then, of course, that would lead to parking near the ranch house which wouldn't be cool with the owners. Also, the routes generally face west which would mean some very chilly climbing for much of the day until the sun came around. If you're in the area in January, the climbing closer to The Box Climbing Areas would be a much better bet. This is a good and necessary discussion. Augie - Probably not. I would much rather camp at the tower campground than at Datil well, as I am sure the majority of climbers would as well. Nothing like being right at the crag when you wake up in the morning. There are few places that is an option. If you have never used one of those wag bags it's really not all that bad. Seriously. Everything is quite contained. I recommend giving it a whorl. Depending on the weather Datil could be good, though you will want to climb in the sun for sure. Remember that Datil is somewhere around 8,000 feet, but if the sun is out and the wind is calm. I know people who have climbed at the tower in December but it is more of a local thing since you can just go when the weather allows. You would definitely be taking a chance with a road trip in November. Also most routes only receive afternoon sun, so unless you are wanting to get on the two routes on the Renissance wall your days will be short. I wasn't impressed with the 30 year old SMC bolt hangers. Also clipped some odd questionable chains with hundreds of rusted washers and lowering on a single ancient carabiner is so 1980's. Regarding the hardware, there was a motivated local named James Hunter who was doing updates. He was focused on the anchors and fixed many of the sketchy older jobs. He has since moved away. Getting replacement gear is not a problem. The motivation to fight the crowds at the tower for the same old routes when there is so much other stuff to do, is. For the Socorro folks anyway. Also there is the ongoing effort to mitigate the effects of the many people who camp and poop there, which also generates many complaints from visitors. Why so many people need to drive onto the virgin grass and make a new fire ring, I will never understand. Back on subject. The tower rock is soft and I imagine some of those old, small bolts are beginning to get weak. Especially those at odd angles near cruxes (for example, i wonder about that second bolt on Blessed and Blissed when I see a dozen falls on it a day, that would be a grounder). I work a few minutes away and sometimes go to the tower on weeknights after work. It is usually much less crowded then. I lack a drill and experience though. So I will try to drag the guy who has been updating hardware at Box out and maybe we can fix some of this stuff. I have a few routes left to redpoint there. I did not realized a majority of the routes needed some anchor replacement until friend told me the crux bolt for red/white queen is hanging out of the rock partially. Last time was at the Tower was the early 90's. After having talked with people who have way more bolting experience than I do, it is my understanding that the Glue-ins are the best option for anchor replacement. John Gregory wrote: Hello every body my name is john/chain i grew up right there in datil i was piddling ran all thru 'mushroom mountain' as phylicyban mushrooms grow so abundantly there i had many many nights of running amuck and for that i l had to leave my buddys and i were great climbers i was young and spending money on wring things so i never bough gear i am planning on heading up there pretty sure we got more coverage on that 20 mile ratius will get pics/gps locations sooner ir later when i fund up if i know what needed ps try leading unknown on renaissance with left hand. Allison M wrote: These two smarty pants decided to hike in from 59. Our road tripping car definitely doesn't qualify as high clearance and we NEEDED to see what Enchanted Tower was all about. The hike is about 15 miles and 6 hours round trip. Do I regret it? No. Would I do it again? No. Well.. maybe. Enchanted Tower is stelllar! Seroiusly, that road is rough. Don't consider driving in unless you have a car that can take it. John Tex wrote: How much snow is there in March, if any at all? John, I'm far from a local but knowing NM winters, the March snowpack will vary. This year I'm guessing there's little snow in the area now. The north-facing slopes will likely retain snow into April but all other aspects ought to be pretty dry. The long road in is in some narrow canyon spots at times so my educated guess is it's kinda sloppy and/or icy in spots into April. Hopefully someone more local will chime in if they know conditions. "These steel non-locking oval carabiners from Austrialpin are great for general utility purposes, like making dog leashes. Their breaking strength of 10kN means they are not suitable for life-supporting activities like climbing or rescue, however." To me, yes these would be good enough. I would lower off of these without any hesitation. A 5/16" quicklink, which is probably what is used to connect the chains to the hanger only has a safe working load of ~1760 lbs, 7.83kN climbtechgear.com/quicklink…. The austrialpin website lists these carabiners as having a load capacity of ~2200 lbs, 10kN. austrialpin.net/products/mi… So while there may be some additional safety factor between safe working load of the quicklinks and load capacity of these carabiners, I wouldn't worry about it. I'd be far more nervous about the old bolts in soft rock at the tower than these lowering carabiners. Confession: T'was me that placed those Austrialpin steel ovals in 2008/2009 on many routes at the Tower. As DisturbingThePeace said, the rating is higher than many oval screw links used to secure chains or other lowering hardware on most sport routes and I've not heard accounts of any screw link failures. I wouldn't consider these biners viable for lead-climbing protection. But I'm very comfortable with the thought of lowering off 10kn steel biners because the redundancy of two biners supporting a mostly static load means the likelihood of a catastrophic failure of both biners is extremely low. Headed down this weekend so I am curious, did the biners get put back? Also, I concur with DTP and Jason that these biners are fine for this purpose. At the suggestion of another Tower regular, I was considering hanging "perma" draws on Goliath (he was actually wanting them on Ripped), at least the upper pitch, as I want to work it over the next few weekends and would love not to have to hang draws each time. I have "perma" in quotation marks because the idea would be to remove them at the end of the season. I have access to nicopress tools and copper sleeves (see link) and wire rope, and was going to make them myself. I have rigging experience and full confidence in the gear. I would use 3/16 7x19 galvanized aircraft cable, which is rated to 4200lb/18.7KN. I'll put steel quicklinks on the hanger end, but was going to use Al wire gates that I have already on the rope end. I would be willing to leave them up indefinitely if people want AND if I could get some donations for quality steelies for the rope side. I wanted to ask the community before doing this as I know leaving "permanent" gear on a route is a pretty hotly debated issue. What do you guys think? Lost Hat: I lost a black Smartwool beanie beneath Goliath last week. I threw it off my head while climbing the route and it landed in the talus below the arete. After sending I was so excited that I forgot all about it and we left that afternoon for the next destination on our road trip. If you happen to find it I would be very grateful to get it back - it has sentimental value as I've had it my entire climbing career. Thanks! A couple questions. I am visiting Albuquerque with a couple colleagues (all climbers) on business in June and was wondering if Enchanted Tower is a possibility. We would be looking for 5.6 - 5.12+, and a chill place to camp for a couple days. Is the new approach possible in a rental car? How about a rental SUV? Can you camp there? How will the temps/shade be that time of year? I'm guessing hot...? Possible in a rental SUV, but insurance may be advisable. It will be hot. The moderates will be mostly in the sun all day, but the east side of the tower (12s) gets good shade. Hey Josh, we've spent a couple of Fourth of July weekends at the Tower and while it's not ideal temps, it's really not too shabby. Our strategy is to get going quickly in the morning, climb until about 1pm, take a siesta back at camp for a few hours and climb again in the evening. You can indeed camp right there in the canyon just below the walls. It's National Forest dispersed camping so there are no amenities--bring all your water and PLEASE bring wag-bags and pack out your poop. Thanks for the info Jason and djkyote! Sounds like the Tower in June can be a good time, even in the warmer temps. We will definitely keep an eye on any closures and make sure we have wag-bags and a suitable rig. Jason - I took a look at your ET Picasa album, awesome pictures! The climbing and camping look perfect. We had a wonderful two days climbing and had the place all to ourselves. It had been almost 17 years since my last visit and not much had changed. In fact, it was better than the last time. No crowds, no trash, good trails, a few new routes, upgraded anchors... E.T. 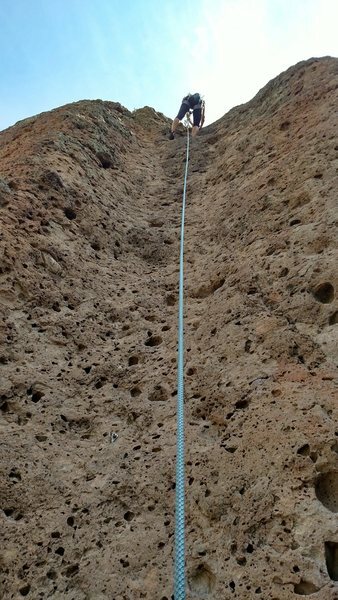 is still the best steep volcanic pocket pulling anywhere and certainly still one of the best crags in NM. Despite 102° in Socorro the temps were perfect in the shade with a nice breeze all day. The flies were very bad at the camping spot but not at the crag. They made our dog miserable. The vegetation and trails around the cliffs were in fantastic shape and well grown in. The gate closure has some benefits keeping visitation low. We didn't see much toilet paper or trash. The dirt road was in good shape but high clearance is definitely recommended. It took about 40 min from the highway. The alternate road is very rough. YOU DEFINITELY NEED A 4WD. My 4WD Escape had a hard time going over the mountain. Do not go if you don't have a high clearance 4WD. If the land owners would open the gate, I'm sure it would be much simpler. The climbing and weather were fantastic!!! Not any other climbers this last weekend. ATTENTION: we have been hiking in this past spring from the highway. Although this is a nice 40 minute hike, this approach may not be an option anymore. Although the vast majority of the hike is on USFS land, you do need to cross a narrow strip of private land. This past weekend "no trespassing" signs sprouted along the fence line, and a note was left on our car, courtesy of Quien Sabe Cattle Company. They own the strip of land from FS Road 6 all the way to the Cleveland ranch, so there is no practical way to get around it. Obviously they don't want their land crossed. The bees on David/Goliath/GoldenStairs have become well established with a nice big honeycomb now. Richard Heying wrote: Hey is the new road open right now? Richard Heying, Did you make it out to ET? Thinking of going Sunday/Monday if the temps are good and the road is still passable. Is the tower accessible and climbable in mid-March? Too cold? Snowy? Have been ogling the photos for years and have some time to climb in New Mexico then. I just got back from my first trip to Enchanted Tower and can't say enough good things about the place, with a special thanks to whomever has had a hand in the trail building around there--it's clear there's been a lot of sweat equity put into those trails/erosion controls/flat belay zones. Definitely looking forward to my next trip. Regarding the drive in - Most of the time, 4wd is not needed, but high clearance is a must. the road is typically rocky and solid - We drove in last night in the rain and I didnt really ever feel the need to turn on 4wd. Matt Jones wrote: What is the camping situation like? I have a truck camper and reading about the road in makes me a little nervous. Is there camping before staring the drive in on the dirt road where I could maybe drop off my truck camper and then drive in? There are common national forest dispersed camping spots along Forest Road 6 between the highway and the private land (old Mojave Academy area), shown here.